This excel workbook put years of experience into giving you the best information for your needs to plan and price your next dirt hauling project. It does not matter the size of the excavation we have given you to power to add in your equipment fleet and there hauling values. Have in minutes how many trucks are required for you to complete your project with the most efficiency and cost savings. 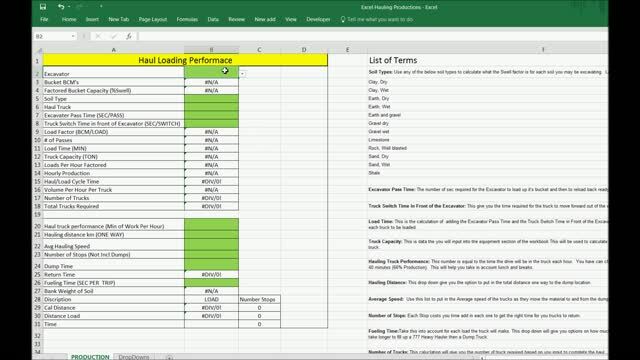 You now have the ability to change the load factors to meet your needs in this excel workbook. You now have the power to put in the right Equipment and number of trucks for the job. If you have your own pricing software this excel workbook will give you the information need to put in the total hour required to complete your planned scope of work. This excel workbook is unlocked so you can change it to fit your need and if you would like to add to it to make it more functional for you. Soil Types: Use any of the below soil types to calculate what the Swell factor is for each soil you may be excavating. Learn the Bank Weight for each type and Loose Weight. Excavator Pass Time: The number of sec required for the Excavator to load up it's bucket and then to reload back ready to reload. Truck Switch Time in Front of the Excavator: This give you the time required for the truck to move forward out of the way and the next truck to park ready to be loaded. 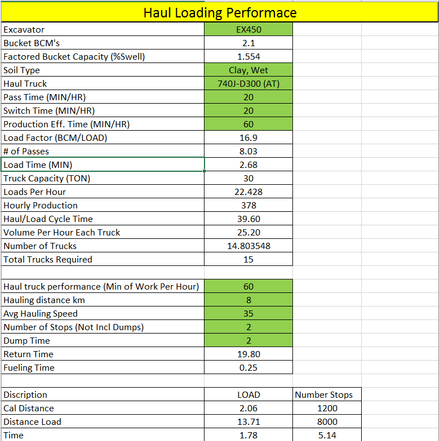 Load Time: This is the calculation of adding the Excavator Pass Time and the Truck Switch Time in Front of the Excavator to come up with the complete time required for each truck to be loaded. Truck Capacity: This is data the you will input into the equipment section of the workbook This will be used to calculate the number of pass required for the excavator to fill the truck. Hauling Truck Performance: This number is equal to the time the drive will be in the truck each hour. You have can choose from 60 minutes (100% Production) to as low as 40 minutes (66% Production). This will help you take in account lunch and breaks. Hauling Distance: This drop down give you the option to put in the total distance one way to the dump location. Average Speed: Use this list to put in the Average speed of the trucks as they move the material to and from the dump location. Number of Stops: Each Stop costs you time add in each one to get the right time for you trucks to return. Fueling Time:Take this into account for each load the truck will make. This drop down will give you options on how much time this will take per equipment size you choose. It take longer to fill up a 777 Heavy Hauler then a Dump Truck. All of the above Term and more will help you produce the best plan for you project. This excavation template will help you get your Haul estimate done right!